Summary: Tempest Maguire wants nothing more than to surf the killer waves near her California home; continue her steady relationship with her boyfriend, Mark; and take care of her brothers and surfer dad. But Tempest is half mermaid, and as her seventeenth birthday approaches, she will have to decide whether to remain on land or give herself to the ocean like her mother. The pull of the water becomes as insistent as her attraction to Kai, a gorgeous surfer whose uncanny abilities hint at an otherworldly identity as well. 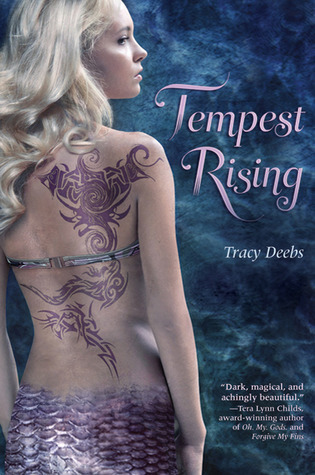 And when Tempest does finally give in to the water's temptation and enters a fantastical underwater world, she finds that a larger destiny awaits her-and that the entire ocean's future hangs in the balance. Oh, I want to read this one so bad! I just finished my first mermaid book and I loved it!!! I have yet to read a mermaid book and this looks like an awesome one to start with! sounds like yet another goodie. I really like how this one sounds. Would love to read it. This book sounds really good. Thanks for the chance to win. that is such an awesome cover! A good friend really liked this book so it was highly recommended to me. Thanks!